I had to cast this on right away! Yesterday, I made my first trip out to the Ashton Store, where the owner Kelly, maintains a little corner of heaven. I went with my friend Francine, the designer of “Fancy That” shawl pins and jewellery. Kelly has a lovely display of these pins as well as local artisan project bags and hand-dyed yarns (details to follow). There is a selection of well known yarns, including Sweet Georgia – yummy and Fleece Artist, Handmaiden, Louet and more. I spotted this Fleece Artist Camelspin right away and just couldn’t put it down. The hand on this yarn is incredible, simply unwrapping the skein, you can appreciated the sheen and drape. This colourway said “Shawl” to me and after searching my Ravelry queue, “Mirth” by Stephanie Japel seemed the ideal pattern to show off my new purchase. 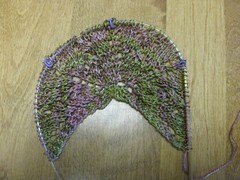 This entry was posted in Knitting and tagged Fancy That, Kanata Knit Night, Mirth Shawl. Bookmark the permalink.